This Comedy Central spoof of the classic children's book 'Goodnight Moon' marks Newt Gingrich's resignation from the presidential race. The once presidential candidate hopeful Newt Gingrich, who officially dropped out of the race for the Republican nomination today (May 2), famously advocated establishing a moon colony as part of his plan for NASA. Now, to commemorate the suspension of his campaign, television Channel Comedy Central has released a spoof on the classic children's book "Goodnight Moon." 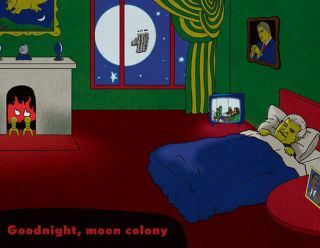 Comedy Central presented the spoof, dubbed "Goodnight Moon Colony," as an image gallery of seven slides representing pages in the mock children's book. "Our storybook farewell to Newt Gingrich's campaign, which we'll always remember for its nuanced policy positions and bold vision of... ah, screw it. We'll remember the moon colony thing," the introduction to the gallery reads on Comedy Central's "Indecision" website. The gallery shows an illustration of Gingrich in bed with a large base clearly visible on the round moon shining through his bedroom window. The scene mimics the artwork in the 1947 Margaret Wise Brown picture book illustrated by Clement Hurd. Other slides in the gallery bid "goodnight" to famous statements made by Gingrich during the campaign, such as "Goodnight, Dirty Unwashed Occupy Wall Street Protestors," referencing Gingrich's dismissal of the anti-corporate-greed activists, and "Goodnight, Bankrupt Health Care Think Tank," a dig at the fact that the Center for Health Transformation, which Gingrich founded in 2003, went under. Gingrich announced his moon colony vision for permanent lunar base during a campaign speech Jan. 25 on Florida's Space Coast. If elected, he would direct NASA to establish a manned lunar base by 2020, with trips to Mars following later. "By the end of my second term, we will have the first permanent base on the moon, and it will be American," Gingrich said at the time. Yet space experts questioned the feasibility of the plan's timeline and economics, especially given that Gingrich also promised to slim down NASA's bureaucracy and reduce the agency's budget. The leading Republican presidential candidate, Mitt Romney, has said he would boost the ties between NASA and private space companies if elected, and would convene a a coalition of leaders from the military, academia and business to determine a course for the U.S. space agency. Comedy Central hosts the political satire programs "The Daily Show With Jon Stewart" and "The Colbert Report." You can follow assistant managing editor Clara Moskowitz on Twitter @ClaraMoskowitz. Follow SPACE.com for the latest in space science and exploration news on Twitter @Spacedotcom and on Facebook.